OK Fingerpainters, for those of you who prefer the comfort of a stylus there is a new one on the market, that I have had the honor of testing for the last 6 months and I must say it is my favorite of the new crop. It’s the Pogo Sketch Pro. Yes, made by the same people that gave you the small foam tipped beauty you could clip to your iPhone. The Pro version sports many new design features, each hitting a home run as far as I’m concerned. Fist, the purified solid aluminum tapered body, more reminiscent of a paintbrush than a pen. It’s about 5.5 inches long, an inch longer than the Wacom Bamboo and inch and a quarter longer than the griffen/targus/boxwave brands. Like the Bamboo it has extraordinary balance. Unlike any others though you can hold it at any angle. That’s right, 5 degrees to straight up 90 it works. I have many, many styluses (styli?) in my collection and no other performs like this one does. It has a new patent pending tip technology involving patterned structures with in the tip itself. Kind of like little perforated holes so the tip is in constant contact with your preferred slab of joy. It is comfortable with my iPad 2 on an easel or iProp as well as my iPod Touch in hand. It’s really responsive. The rubber tip being the same size and “squishiness” as the Bamboo (which is also a good choice for those who prefer a pen type stylus). The Pro also has a comfort grip, my hand never tires of using it. And best of all, it’s affordable at $24.95. It comes with 2 tips (I didn’t know that while I was testing.) The new rubber one and the classic foam tip. And even more good news, in October you will be able to purchase just replacement tips if anything happens to your Pogo Pro. I have had a fair share of the rubber tipped wonders just stop working and I love the idea of protecting my initial investment. I don’t know the price on those yet. I’m sure an announcement will come soon. Now for those of you who are going to ask how it compares to my stylus socks…. I still LOVE those too. I am going to admit that my homemade charcoal holder with a shapedad plug shoved in it is still my favorite, but that’s because working with an easel the almost 10 inch length is best for me. But I am an odd duck. I do carry the Pogo Pro everywhere I take my iPad or Touch. It’s especially good at taking notes as well as painting. I am waiting for the kickstarter Flow brush and the Cosmonaut… last I’ve heard they are still in production You will get my opinion as soon as they get to my door. 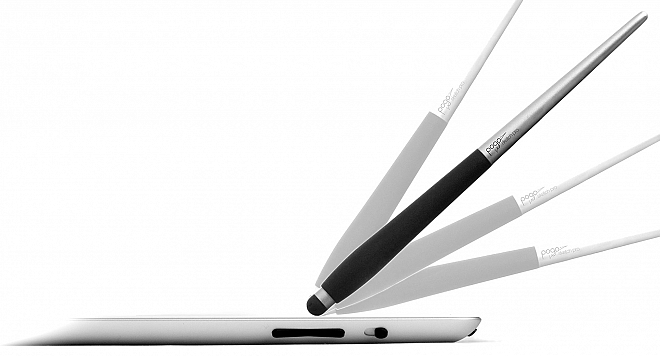 Conclusion… if you like a stylus, You’ll love the Pogo Sketch Pro. This entry was posted on Tuesday, August 30th, 2011 at 11:21and is filed under . You can follow any responses to this entry through the RSS 2.0 feed. You can leave a response, or trackback from your own site. Update I received my purchased Pogo Sketch Pro in the mail yesterday, it comes in a great package with the pro stylus and the extra foam tip and a little stylish black bag to put it in. Happy painting everyone. This looks awesome. I have pretty big hands, so every extra inch is really appreciated! Thanks for the review. I’ll definitely be keeping an eye out for this. Are you serious? Were you paid to write this? I’ve had mine for two days and while the design is gear and it looks really sharp, it performs HORRIBLY. 1 out of 12 strokes responded. 1 out of 15 strokes responded. New awesome tip technology? SNAKE OIL. Jonathan, I was not paid to write this. My opinions are certainly my own and are not influenced by $$$. I buy my own styluses as well. That being said I’m really sorry your stylus is not working I would RUSH get another sent your way. I have had a couple of boxwaves go bad. Something in the coating they put on the rubber used for the tip, and I’ve experienced the skipping lines you seem to be having. I do know the folks at Ten One and they are very reasonable just email them. FYI I have 3 and all work perfectly. BTW I am waiting for the jot. Will look into the 3M. If you go back further you will see this is NOT the only stylus review I’ve posted and I do try to do it as honestly as I can. Continued success at Dreamworks. I bought a couple to have backups. Tried another thinking the first one was flawed, some sort of dud. It was worse than the first one. There are extra rubber parts hanging off which weren’t properly cutt off during manufacturing… they’re beautifully designed aesthetically but do not deliver the promised functionality. I have emailed Ten One and am waiting for a reply. I wish the Sketch Pro had the tip that the 3M stylus has- that would be one amazing stylus. I understand you’re in contact with customer service… Hope all turns out well. Enjoy the rest of your holiday weekend. Thank you Susan, for your honest opinion. I always know I can rely on all your reviews. You are our go-to gal. I think I got a dud too! I like the styling though. I do wish it were a little longer as well. Overall a decent design. I just need to work on getting a replacement I think. Rebelpapa, haha… used to seeing you in the Procreate forum. I’ve tried two of them, the second was worse than the first. Heard back from Ten One. They acknowledged that it has problems with screen protectors. That seems like a major design flaw to me. The 3M Smart Pen doesn’t seem to know if a screen protector is there or not. Works great. I tried the Pro without any screen protector and it’s just as bad. Shrug. I too love the design of the Sketch Pro. Heck, I love just holding it, and pretending that it works. @Susan – I’ll keep giving it a try and hope it breaks in! @Jonathan – I’m watch in lots of places and participate in some 😉 I do have a screen protector so maybe that’s the problem. WEIRD I use a splash Masque screen protector, which is thinner than griffin and some of the others but they work for me. I have been upset about this so I got 3 more and two worked great out of the box ONE did not which I thought was weird, so I used it real hard mashing the tip this way and that like there was something that need to make contact with the screen and now that one is fine too. I used my fingers to mash it a bit as well. And now it’s OK. But none had hanging rubber or anything. Hi Susan I have been reading all these comments and I feel really unsure about whether or not to get a pogo sketch pro even though I love the design and concept of the new tip. I was just wondering once you broke in the new tips did they work well enough where they didn’t cause broken strokes even when you used very little pressure. Also do the rubber tips glide easily on the screen with very little pressure? I appreciate any information you can give me also I really like your work! OK everyone…. I really fixed it, remember I said I had an iffy one… Take your one that is not working properly and press it hard on a table DO NOT USE your iPad screen… you don’t want to ever hurt that. Then smush it around a bit… rotate that tip. Try it again repeat smush if necessary (I did it twice) I swear my iffy one works perfectly after that. REALLY wish you could see the difference. NOW if that doesn’t work get you self a replacement. So Kevin, I’d say go for it. I use a pretty light touch. I am still happy with mine. I tried your tip to push on the table and it didn’t help. I thought maybe I didn’t do it hard enough so I mushed it around again and my tip tore right open! I would use caution when doing this. Rebel, I said smush not mutilate. Hahahahqha. Well get yourself on the horn with the pogo folks. I think the biggest flaw with this stylus is the rubber grip. Try using it holding it only making contact with the rubber grip. See how responsive it is. Then try it again, holding it only on the metal part of the stylus. See if you notice a difference. for me it’s night and day even though the day is still very gloomy. Strange, I do not notice any difference when holding it only on the rubber part… Either on the iphone 4 or the ipad 2. I agree, no difference rubber grip or metal. And like Niklas says all of mine working great. @all those who are having success with the Sketch Pro- are you using screen protectors or bare? I use a splash masque. Didn’t know about that one… maybe you’ve got a good one and I don’t. Eh, I don’t care much anymore. I saw your Flicker site- wow! Beautiful stuff! And prolific! Go MI! They sent me three more at no cost. None worked anywhere near well. One worked about 50% of the time the other two worked maybe 10-20% of the time. Going to send them all back. I’ve tested seven of them at this point. Working 40-50% of the time is the best I’ve gotten from them. My screen protector could be enhancing the problem, but not by much. Even if this is the case, it shouldn’t be the case. Every other stylus I have works perfectly with a protective film (Dagi, Jot, iFaraday, Boxwave, AluPen, 3M SmartPen, Targus, SGP Kuel, Wacom Bamboo…) If the screen protector is part of the problem with the Pogo Sketch Pro is the only stylus I’ve used that struggles with it. Hey obviously they do not work for you. Please send them back. Sorry to hear your bad experience…. I sure wish I had them for my students… anyway I have decided to NEVER WRITE a review again…. And so with this reply I divorce my name from this website…. I guess that’s all I can do. Be well. Huh? Wow… that was extremely dramatic. Susan does wonderful tutorials and honest reviews. Wonderful. Honest. On her time, no $$, just to help all of us. To share her vast experience. Without wishing to start a flame war here at no time was there an apology for saying “you should blog honestly”. I am impressed with this stylus. It draws well and the ergonomics are great. I am basically a finger painter but I since i now keep this pen in its bag tied to my iPad case I find myself using it more and more. My advice ditch your screen protector. For me iPhone and iPad screens need protecting only in transport and storage. I hate them. I find whole idea of using a protective film is ridiculous to me unless you are working underwater. That said stylii are not for everyone. If you don’t like it move on. And please don’t doubt susans integrity, she has been making and testing stylii since the beginning. And is generous enough to share her experience. Thank you Susan for another great article. And please, dont ever stop writing. My first response to the review was my honest one. It was my honest reaction having just tried over and over with the same product, more than one. From that point on, we had been simply discussing the reviewed product. Susan offered advice on how to improve the tip of the thing by breaking it in. We went back and forth and yesterday I became familiar with her paintings. Left her a comment about how beatiful her work is. Since then I’ve only updated on my… curse- can’t think of a better description. Out of nowhere I’m lashed out at. I read it twice to make sure I was reading it right and that it was her who wrote it. Deborah, you can write to me directly. It’s safe. It’s annoying when someone talks right in front of you like you’re not there. Mathew, no chance. There’s no way I’m going to risk the screen of an $800.00 machine who’s display is very important to me. These screen do scratch. Deep scratches are more rate, but over time slight surface scratches will appear and cause slight differences in displayed image’s brightness and color. I didn’t get your point about working under water. It wouldn’t be the screen you’d need to be worried about. I do have three styluses which do work extremely well- 3M SmartPen, Jot and the new Dagi (has a disk tip with a spring) I HIGHLY recommend them and thing you all would find them to be great. Here are a couple of my reviews. You’re all welcome to come and leave me nasty comments if you want. Clearly I’m not wanted in your little community here. I came in frustrated and looking for help with the Pogo. Wasn’t trying to make anyone mad. Oh, and Susan… I’ve got 6 of these Pros sitting here. Three I have to return because I didn’t pay for them. The other three I can either return for a refund or you can have them for your students. I actually have a ton of styluses laying around that I’d be happy to donate. If you have a place you’d like them sent, just let me know. This is not an apology. It is a separate deal altogether. Thank you friends who have chimed in here. It is another day here and events from last night somewhat washed away, Jonathan, your comments were the tip of the iceberg from another drama, send them back. I am still drained and find no reason to continue on this tread, it has become too personal and not constructive for anyone. I just received my stylus in the mail. I was very disappointed at first but I think the smushing worked!! I will repeat and see if it writes any better. Thanks Susan. It should get better with use. Good luck. When Steve jobs introduced the iPhone he made his joke about not needing a stylus, we have 10 of them on our hand. This never stuck, a lot of people like styli. I am not yet sure that I am one of them yet. I don’t see the utility of a screen saver while you are painting. I have never created even slight scratches through painting. Can a stylus damage the screen? My fingers never have. Susan tells me that it creates an interesting tactile difference. My comment is that I can imagine ever putting anything between me, my fingers and the screen. But I guess I will have to go and try one now. About the screen protector. I had NEVER used one, and no… no stylus ever hurt the screen…. but then I started painting plein air and the reflections were killing me, a fellow FP sent me off to get a matt one… made by splash, and there was no going back. Love the matt, love the less glare and most of all I love not having to stop and clean the screen so much. And there is a tactile thing I like. Definitely not using it to protect the glass. Fortunately there are no right or wrong ways, like every artist everywhere, favorite equipment, even if it’s fingers, become an integral part of making art. After using 10/0 and 20/0 brushes and sterling silver mechanical pencil, I have to say I feel odd using my finger for 90% of my work. I do use one on my writing apps (e.g. Noteshelf) and that feels natural. But as you say, we all use the tools as serves us best. I also don’t like a screen protector. But i never paint outdioors. That must make a difference. I’ve just found this thread and have been reading with interest. I always use a finger myself, and find it always far more responsive than a stylus. Also, nobody seems to have mentioned the problem that resting the heel of your hand on the screen causes the screen to slide about as it interprets this as a two finger gesture. Is there any kind of cure for this, other than wearing mittens? PS I believe one of the tricks to learning to finger paint is never to succumb to the temptation to use an offset, as this can upset the accuracy training of whichever digit you use. Valerie–I rest my pinkie and ring finger on the screen as a brace or mahlstick and not the heel of my hand. If you buy a box of those rubber finger tips used to turn pages, etc. (office supply about $3 for 12) it keeps your fingers from being interactive. They’re a lot more comfortable than a glove with the fingers cut off and they last forever. You have the added advantage of being able to say “where are my fingers?” when you mislay them. I’ve had my pogo pro for about 3 days and am really disappointed with it. I’m having all the problems listed in these replies, inaccurate, missed strokes and it’s much worse than my no-name stylii from Amazon and my Boxwave one. I do use a screen protector so I’m off to try “breaking in” the tip and swapping it for the standard tip. This site has been so useful in discovering practical painting apps, I wish I’d thought to check it before buying my Pogo. Firstly, I’d like to thank everyone who wrote comments in here.. they’re all very helpful; especially thank you susan for the awsome review. Well.. I also have been reading all these comments and trying to decide whether get the tool or not.. and btw just to let you know that this blog is one of the first reviews that pop out when you google the product. The thing is; on the FAQ at tenonedesign.com (which is the offical page of the tool for the ones didn’t know) they clearly indicate that SCREEN PROTECTORS are NOT SUPPORTED by the pro stylus… so I guess this can can end some discussions and make a huge difference to some people while purchasing it. WARNING: This is absolutely the WORST stylus on the market! I am a designer and artist by trade, and was very excited to get this stylus based on reviews, but after using it for less than an hour the cheap, poorly designed nib tip started falling apart. Ten One Design should be ashamed of putting out such a sub par product. If I ever hear of a class action lawsuit against them for scamming people out of their hard earned money with this joke of a stylus, I’ll definitely sign up. After reading through all of these comments, it sounds like the Pogo Sketch Pro has quite a few issues… I’ve tried several different styluses, and I would highly recommend the TruGlide from LYNKtec to anyone looking for an all-around awesome stylus! The TruGlide has a very cool and unique microfiber tip that really does just glide across the screen! It also seems to have a little spring underneath the tip, which completely eliminates the squishy-ness that seems to be a common problem in all of the rubber-tipped styluses out there. And since the tip isn’t made of rubber, that means you don’t have to worry about buying replacement tips in a couple of months (or weeks)! I love my TruGlide and really do recommend it to anyone looking for a nearly flawless stylus! It’s awesome!